Recruiting is the most dynamic, creative, fast-paced, and exciting career on earth – for some. Recruiting is one of those professions that you have to love to do it well – if you’re not committed, it’s not worth doing at all. Everything we do on this site is to help recruiters make better decisions and progress their careers. But if you feel like you’re a bad recruiter and just can’t get traction in the career, it’s a good idea to get out of the profession. Both corporate and agency recruiters are usually passionate about their careers, and if you’re not, chances are the profession won’t take you anywhere worth going. Human Resources: If you find that you enjoy the organizational and relationship oriented aspect of working with people in their careers, but do not enjoy the “pitch,” you might want to consider a career in HR. HR Generalists, Benefits Coordinators, and other functions require highly detailed understanding of corporate policies, benefits systems, laws, and technology. Human Resources can offer a great career path with progressive advancement. Career Counseling: Some recruiters love helping candidates – they will accidentally spend hours interviewing prospective candidates, helping them with their resumes, giving them career advice, and advising them on different industries and professions. It can be very satisfying to help people advance their interviewing skills or even help a candidate decide on a career. However, especially in agency recruiting, this type of relationship can get in the way of performance. 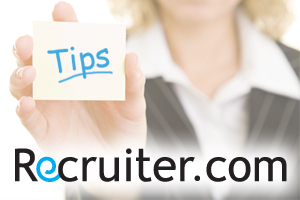 Recruiters need to find a happy medium between volume and the depth in which they help candidates. Career counseling has many different iterations, for example college career centers, career psychologists, job counselors, etc… If the career mentoring aspect of recruiting is clearly what you enjoy most, one of these other professions might be a better career. Marketing: Recruiting sales and even sourcing candidates involves a very strong element of marketing. Recruiting salespeople often market their company’s services through mailings, Internet ads, and other advertising vehicles. Recruiters and sourcers also market to candidates by developing rich media recruitment campaigns, great job ad copy, etc… If you enjoy the actual marketing process and developing and analyzing data, a career in marketing might be a good alternative. A good test is if you think of your potential candidates as a “target demographic,” it might be time to move on. Social Media: Recruiters naturally gravitated toward social media outlets because they are natural relationship builders and because reaching out to broad numbers of professionals fits with the recruiter’s job. However, social media can be a bit of a rabbit hole – a recruiter too caught up in social media and social networking might never come out. If you enjoy the technical elements of social media, enjoy writing and community building, you might consider making a career change. There are a lot of new jobs in social media administration, web copy-writing and marketing, and developing social media employment campaigns. If social media has become more than a method of developing clients and candidates – if your interest lies mostly with the tool itself – it might be time to move on. If you feel like you can’t succeed in your recruiting career, it might be time to examine why. It should be said that passion is a job requirement for a recruiter. If you’re not 100% invested in your recruiting career, changes are you won’t go very far. Recruiters often spend time trying to help candidates identify their real skills and true calling. It can be much harder to turn that perspective within. However, if you feel like a “bad recruiter,” this should be cause for further thought and examination of your career.